More Americans than ever before are entering their retirement years and reaping the benefits of new advances in medical technology to extend their life much longer than ever before. However, the increasing number of senior citizens moving into long-term care facilities has placed a heavy burden on nursing homes that are becoming understaffed and overcrowded. 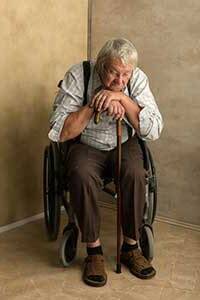 The Roswell nursing home abuse & neglect attorneys at Nursing Home Law Center LLC have witnessed a rise in the number of cases involving neglect and abuse in recent years that corresponds to the heavier burdens placed on nursing facilities. Throughout the year, Medicare routinely collects information on every nursing home in Roswell, New Mexico based on data gathered through investigations, inspections and surveys. According to the federal agency, investigators found serious violations and deficiencies at forty-three (54%) of the eighty Roswell nursing facilities that led to resident injuries. If your loved one was harmed, injured, mistreated, abused or died unexpectedly from neglect while living at a nursing home in New Mexico, your family has rights to ensure justice. We invite you to contact the Roswell nursing home abuse & neglect attorneys at Nursing Home Law Center (800-926-7565) today. Schedule a free case evaluation and let us discuss your legal options for obtaining monetary recovery through a lawsuit or compensation claim. While there are many residential nursing facilities that provide compassionate, loving care in a safe environment, other nursing homes tend to place profits over comfort, cleanliness and kindness. When these facilities fail to provide protection for a loved one, it is crucial for family members to contact a competent New Mexico elder abuse attorney to seek justice and secure accountability. The number of cases of abuse, neglect and mistreatment in nursing homes is expected to rise exponentially in the years ahead as more middle-aged individuals enter their retirement years. This is especially true in Chaves and Eddy County where statistics show a dramatic rise in the number of retirees over just the last five years. Of the more than 125,000 residents in both counties, nearly 16,000 are 65 years and older, where nearly one out of every five will require skilled nursing care at some point in the future. The limited number of available beds in nursing facilities and a lack of adequate staff will likely increase the number of cases involving mistreatment. Our Chaves County nursing home neglect attorneys recognize that long-term care has become a booming business, where many facilities are operated by large corporations where residents become nothing more than a money-generating part of doing business. Family members are often frustrated when researching where to place a loved one who requires the best-skilled care in their local community. In an effort to help, our Roswell nursing home attorneys continuously review and evaluate publicly available resources including information found on Medicare.gov. Our team of attorneys assesses the information involving opened investigations, safety violations, health hazards and filed complaints against nursing facilities all throughout Eddy and Chaves counties. Family members often use this valuable information as an effective way to make an informed decision based on the best data available on nursing facilities in Roswell, Artesia and Carlsbad. The information below a list of Roswell area nursing facilities compiled by our New Mexico elder abuse attorneys listing homes in the community that currently maintain substandard ratings compared other facilities throughout the United States. Additionally, we have added our primary concerns by showing specific resident cases who have been harmed, injured or died as a result of negligence, mistreatment or abuse. Some of these cases involve facility acquired bedsores, a lack of following physician’s orders, unsanitary conditions, maintenance issues, wandering/elopement from the nursing home, the spread of infection and other serious problems. The last documentation of a fall occurred at 4:30 PM on 05/26/2015 when “the resident was found lying on the floor in his room by the bed and wheelchair.” Documentation in the nursing notes shows the resident sustained injury. The Care Plan had documented four falls that occurred at the facility without new interventions. These falls occurred on 02/13/2015 through 02/15/2015 and again on 02/18/2015. Our Roswell nursing home neglect attorneys recognize that failing to provide every resident an environment free of accident hazards and take appropriate measures to minimize the potential of additional falls could place their health and well-being in immediate jeopardy. The deficient practice by the nursing staff at Casa Maria Healthcare Center and Pecos Valley Rehabilitation might be considered negligence or mistreatment because no effective actions or interventions were developed or implemented to minimize the potential of additional falls after the first fall and subsequent falls had occurred. Additional History and Present Illness documentation dated 11/25/2015 from the hospital revealed that “on examination, patient’s Foley was found to have dirty urine and urine bag was changed.” This was signed by the physician at the hospital. The hospital documentation also noted a urinalysis report from 11/25/2015 revealing the resident was suffering from a urinary tract infection and had a high white blood cell count, high red blood cell count, and high bacteria count. Our Roswell nursing home abuse attorneys recognize that failure to provide adequate treatment to a resident with an indwelling urinary catheter increases their potential of developing a urinary tract infection. The deficient practice of the nursing staff at Mission Arch Center might be considered abuse or mistreatment and that their actions raise alarms of neglect by the staff and doctors in the hospital emergency room. The state investigator reviewed a resident’s 02/26/2015 Nursing Progress Notes that revealed that the resident had a surgical wound on the right hip that was cultured and found to contain infectious MRSA (Methicillin-Resistant Staphylococcus Aureus). The investigator then reviewed the 04/29/2015 Facility Incident Report indicating that “the family of the resident alleged the CNAs are too rough when caring for and think that they caused the bruises on the resident’s outer hand and forearm.” A notation was made that a review of the facility’s Five-Day Follow-up for the allegation concerning the resident consisted of eight sentences and does not thoroughly complete the investigation. The thought of a loved one being abused or neglected in a nursing facility is beyond disturbing. Often times, the victims are the most vulnerable among us, especially those who are unable to easily defend themselves or lack the capacity to speak out of the deplorable and heinous actions of caregivers or other residents at the facility. Falls Caused by Neglect – Statistics indicate that nursing home residents are twice as likely to suffer injuries from falling compared to elderly individuals that live at home. For the disabled, infirmed and elderly, falling can be extremely dangerous that often results in permanent physical limitations, chronic pain, anxiety, ongoing health issues and even death. Prescription Errors – Medication mistakes are a serious problem in nearly every nursing facility in the state. The most common errors include giving the resident another resident’s medication, not giving the resident the correct medication or the correct dosage or at the right time. Other serious concerns involve ongoing pain the resident experiences because they were never given their narcotic due to theft. Malnutrition or Dehydration – Most elderly individuals lack the capacity have immediate access to food and beverages when hungry or thirsty. A lack of a nutritional diet or and accessibility to water can cause irreparable damage, serious harm, a change in their health condition or even death. Bedsores – Every bedsore (pressure sores; decubitus ulcers; pressure ulcer) is avoidable, even in resident’s who are mobility challenged and unable to reposition their body without assistance. If a loved one develops a facility-acquired bedsore, it might be the first indicator that neglect, mistreatment or abuse is occurring in the nursing home. Elopement or Wandering – Typically, residents who are cognitively impaired require ongoing supervision to minimize the potential of wandering or eloping away from the facility. Any incident that evolves elopement without detection could be considered negligence or mistreatment of the nursing facility that endangers the life and well-being of the resident. Nursing facilities are legally required to provide every resident acceptable standards of care. However, mistakes in treatment, inadequate staffing, a lack of training, physical assault and ignoring the needs of residents are just a few of the many problems that occur in nursing homes throughout New Mexico. All incidents of mistreatment, abuse and neglect are 100 percent preventable. Unfortunately, many residents lack the ability to protect themselves or feel powerless against retaliation for speaking out as to what is happening that is causing them harm, injury or pain. If the suffering, injury or pain your loved one is experiencing appears to be caused by negligence, abuse or mistreatment at the nursing facility, it is crucial to take immediate legal action. The Roswell nursing home abuse attorneys at Nursing Home Law Center LLC can assist you in understanding your family’s rights and can take appropriate and immediate action to stop the harm now. We urge you to contact our New Mexico elder abuse law firm today by calling (800) 926-7565 to speak with an attorney about your situation. We serve clients all throughout the state including those living in the Roswell area and throughout Chaves and Eddy counties. We accept all wrongful death lawsuits, personal injury claims and nursing home neglect cases through contingency fee agreements. This means all of your legal fees are paid only after we negotiate your out of court settlement or win your case in a jury trial.